The Duke of Cambridge was seen getting on a flight at LaGuardia Airport in New York heading to Washington. 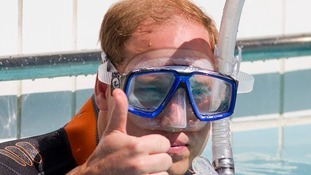 The Duke of Cambridge marked his new role as president of the governing body for snorkelling and scuba diving - by taking a dip in a pool. The piece was painted by Dan Llywelyn Hall, whose portrait of the Queen last year was criticised as looking like a Spitting Image puppet. 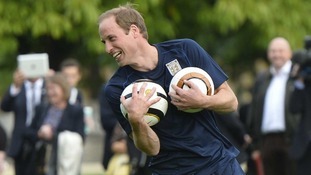 Prince William performed an impromptu rendition of Living On A Prayer with Jon Bon Jovi and pop star Taylor Swift.